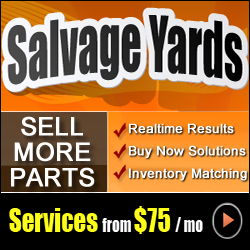 TLS is one of the largest wrecking yards in Northern California specializing in auto dismantling of all years and models. Our staff has a combined experience of over 70 years in the dismantling and recycling industry. We offer our services directly to the General Public. In addition, we offer wholesale pricing to the automotive professional including dealerships and repair shops. Every engine, transmission and used part is tested for quality assurance and includes a 1 year warranty. Customers seeking additional protection can purchase an extended warranty for any situation.